Boxing fans are in for quite a weekend next month as “the Divas” go head to head for a world title bout televised on ESPN September 13th just days before the long anticipated GGG Canelo rematch. 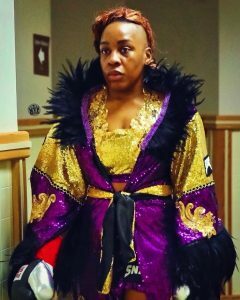 It’s a ten round battle of East Coast versus West Coast as Franchon “The Heavy Hitting Diva” Crews-Dezurn (3-1) faces Maricela “La Diva” Cornejo (12-2, 5 KOs) at the Hard Rock Hotel and Casino in Las Vegas for the interim WBC Female Super Middleweight Title. Not shy of the spotlight, former American Idol contestant and two time World Medalist Crews-Dezurn is ready to show the world what women’s boxing has been missing. 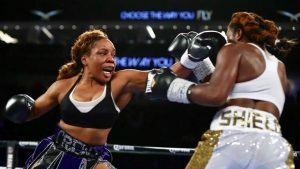 Her only loss as a pro was to two time Olympic gold medalist and undefeated professional boxer Claressa Shields (6-0) and she’s on a mission to avenge that loss. She became a free agent earlier this year and remains confident her boxing will do the talking for her. Fans can follow Crews-Dezurn on Instagram and Twitter at @TheHHDiva. Franchon Crews-Dezurn is a 15x National champion, 5x Pan Am Champion and two time World Medalist (both 2012 and 2016). She’s married to professional boxer Glenn Dezurn, Jr. (9-2-1, 6 KOs) with whom she resides in Baltimore, MD. In 2011, Crews-Dezurn made history by becoming the first of three women in the United States to qualify and compete in the debut of women’s boxing at the Pan American Games. She is currently a student and also an entrepreneur, designing fight night clothing under her own brand, DEZEARNED.